2018 was a banner year for Patterson Park. The year closed out with a Roots & Wings Festival celebrating trees and pollinators and a glowing display of luminarias over the holidays. The Roots & Wings pop up was part of a city-wide celebration of Arbor Day and Monarch Appreciation Day. There were nature-based crafts, a tree ID scavenger hunt, story time, and self-guided tours of the community garden's butterfly gardens. Friends of Patterson Park was awarded two major grants in 2018 totaling $98,000; both projects will be installed and unveiled in 2019. The Austin Park Foundation is funding new playground equipment, seating, and a small natural play area featuring large tree stumps. The Neighborhood Partnering Program will fund new park furnishings, including grills at the small pavilion, recycling containers, benches at the volleyball and tennis courts, a picnic table and boulder seating by the Dance of the Cosmos sculpture, cedar trail markers and an information kiosk with a map designed by neighborhood illustrator Caitlin Alexander. The grants required both financial and volunteer hour matches, and we are so grateful to the folks who helped mulch Patterson’s heritage oak trees during It’s My Park Day and the neighbors and business sponsors who have donated to Amplify Patterson campaigns, including Nature’s Treasures, Franklin Barbecue, Thunderbird Coffee, Urban Patchwork, Nicole Cooper Realty, and Erin Tassoulas Design + Build. 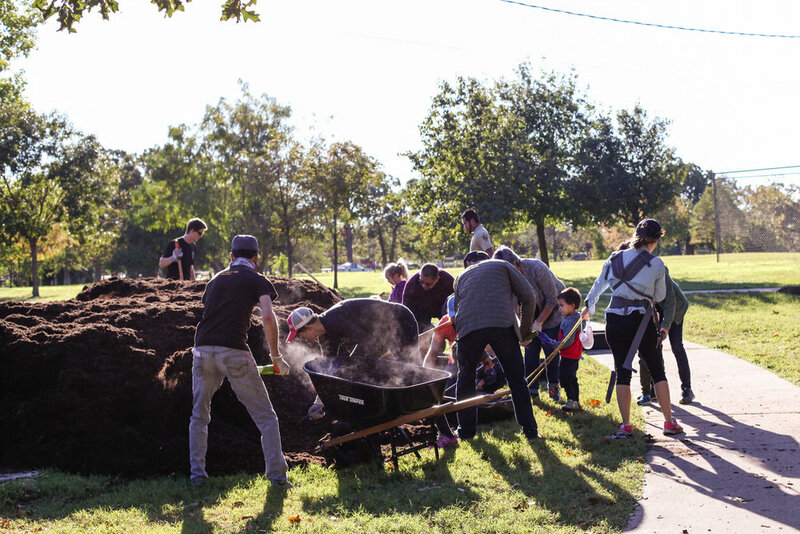 We’d love the support of new Cherrywood neighbors during Amplify Austin 2019 as we prepare for the next phase of our Neighborhood Park Plan: improvements to the athletic fields and courts. Projects could include resurfacing and shading the basketball court, improving the basball field backstop, and adding a small fitness station along the trail. To be part of the discussion, email fopp.atx@gmail.com. Don't miss our annual Easter Egg Hunt and community potluck on Saturday, April 20, at 10 am.